Obituary for Marjorie Louise Plough | Langeland Family Funeral Homes, Inc.
PLOUGH, Mrs. Marjorie L. "Marge"
Marjorie passed from this life and into the arms of her Lord and Savior Saturday evening April 28, 2018. She was born July 23, 1924 in Petoskey, Michigan to George and Gladys (Allerding) Ford where she grew up and graduated from Petoskey High School in 1943. On June 22, 1946, Marjorie married the love of her life, Richard Plough. They made their home in Portage and raised their son Darrell there. Her gift of hospitality and helping others were attributes that endeared her to everyone she met. She was young at heart and loved welcoming friends and family into her home. She enjoyed the outdoors and loved working in her yard. Early in her life she worked for the JC Penney Company in Petoskey and Kalamazoo and was responsible for dressing the windows & mannequins. 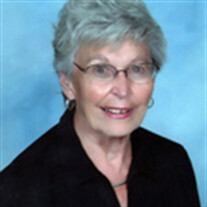 In 1962, she started working as office manager for Dr. R. A. Janke in Portage, retiring in 1988. Marjorie was also a member of the Pathfinder Church in Portage. She served in many areas in past years including communion preparation, kept attendance records & nursery volunteer. Marjorie was preceded in death by her husband, Richard on February 2, 1972; 2 brothers, Robert Ford and Jimmy Ford; and a brother-in-law, Elmer Frazier. She is survived by her son, Darrell (Rosslind) Plough of Plainwell, very special friends, Chuck Jako of Portage and John (Judy) Decker of Delton, MI; a sister, Eleanor Frazier of Watervliet, MI; a sister-in-law, Beverly Ford of Petoskey, MI; a nephew; and numerous nieces and cousins. Marjorie's life will be remembered and celebrated 11 o'clock Friday, May 4th at the Langeland Family Funeral Homes, Portage Chapel, 411 E. Centre Ave with Pastor Ron Hansen officiating. Friends are welcome to visit with the family one hour prior to the services at the chapel. She will be laid to rest next to her husband, Richard in Portage South Cemetery. Memorials may be directed to Pathfinder Church, Paws with a cause, or Kalamazoo Loaves and Fishes. The family would also like to extend their sincere gratitude to the staff at Brookdale Assisted Living and Bronson Commons for their loving care during her stay.